given day. For many companies, maintaining an in-house IT team is not a practical solution. IT outsourcing through managed service providers can give you the service you need and benefits you may not expect. 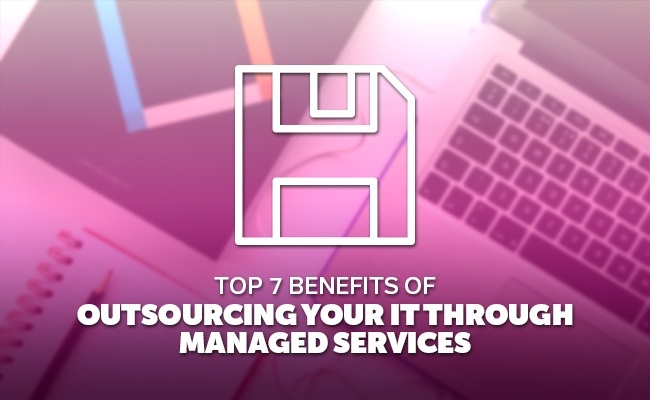 Here are Top 7 Benefits of Outsourcing your IT through Managed Services. One of the most surprising benefits to IT outsourcing is that it can actually save you money! In-house IT teams can be very expensive to hire and train and may not be used efficiently, as the IT workload can be quite variable. Outsourcing your IT to a managed service provider gives you the support you need when you need it, and you only pay for the services you use. Ultimately, this can save your business money and help you budget more effectively. A managed service provider knows how to help your business run more efficiently. By helping you redesign workflows, automate tasks, and upgrade equipment, you can have state-of-the-art technology to help you run more efficiently and keep up with your peers and competitors. An in-house IT team only sees the problems that have already arisen in your business. When you use IT outsourcing, you are hiring experts that see a wide variety of IT problems every day. This means when a new problem arises, they already know how to fix it for you quickly and at lower costs. The IT professionals at a managed service provider are constantly undergoing training in the latest technology to provide you the best service available. Your company has limited resources. When you are forced to spend time and energy making IT decisions on complex systems, you are being taken away from the goals of your business. IT outsourcing allows you to focus on what you want for your business, while your managed service provider supplies the IT support you need to get it. Cyber security is an extremely important topic. Your network has vulnerabilities you must protect against. IT outsourcing allows you to tap into the extensive knowledge of experts trained in this topic to provide you with security solutions that will work for your business. Your managed service provider can help keep your software and security up to date for your protection. Today, many industries have compliance standards that must be met. Without additional support, it can be easy to fall out of compliance, which can cost your business significantly. IT outsourcing lets you focus on doing the work, while your managed service provider helps you implement strategies to maintain compliance for your industry regulations. If you have a small- or medium-sized business, you simply do not have the same range of resources that larger corporations enjoy. However, IT outsourcing lets you have the same level of expertise, equipment, and support as these larger companies. This allows you to keep up with the bigger companies, while providing the excellent customer experience your clients expect. IT outsourcing can help grow your business, save you money, and keep up with the latest technology. It’s important to choose the right managed service provider, so be sure to know what to look for in an IT consulting business. Outsourcing your IT may be the right choice for your business.